I started posting a 6-day-a-week comic strip on the Web in February 2000, and I've been doing a daily comic ever since. I co-wrote "How To Make Webcomics," and wrote "The Everything Cartooning Book" and "The Webcomics Handbook." I was part of the popular "Webcomics Weekly" podcast, and I host the new "Webcomics Confidential" podcast. Apr 12, 2019	 What if I told you the algorithm is your friend? Mar 11, 2019	 Social media: Is it for promotion or content? Mar 7, 2019	 ComicLab ep. 62: What’s your creative process? Feb 7, 2019	 Is Patreon “Sustainable”? Jan 1, 2019	 Happy New Year! Nov 27, 2018	 ComicLab Ep 46 — Are you a webcomics ‘hustler’? Oct 29, 2018	 Twitter — losing heart? Sep 21, 2018	 Standard sizes for comic strips. Sep 20, 2018	 ComicLab Ep 38 — Should you reboot? Sep 13, 2018	 ComicLab Ep 37 — Why do we hate thought balloons? Aug 29, 2018	 Why do we hate thought balloons? Aug 13, 2018	 ComicLab Ep. 32 — You’re Not Talented. And That’s Good News. Aug 2, 2018	 ComicLab Ep 31 — NSFW comics… any regrets? Jul 17, 2018	 Is the “About” page… outdated? Jul 7, 2018	 Mailbag: Am I original? May 11, 2018	 Webcomics Confidential — How Do I Get More Patrons on Patreon? Apr 23, 2018	 What if I told you the algorithm is your friend? Apr 19, 2018	 ComicLab Ep 16 — Hashing out hashtags, online gag comics and update schedules! Mar 29, 2018	 Need help with your taxes? Mar 23, 2018	 ComicLab Ep. 12 — Kickstarter tips that really work, the great Backerkit debate, and much more! Mar 15, 2018	 ‘Ringo Awards… and The Death of the Harvey Awards? Feb 8, 2018	 Writing: Where to start? Jan 31, 2018	 Webcomics.com Poll — What’s the Most Important Site Improvement? Jan 12, 2018	 ComicLab — Why comics? Dec 14, 2017	 The Patreon crisis — Would it Have Passed? Oct 20, 2017	 Mailbag: What’s the average price for a graphic novel? Oct 12, 2017	 Webcomics Confidential Ep 24 — Are We in a Webcomics Bubble? Sep 28, 2017	 Webcomics Confidential Ep 31 — What’s wrong with indie comics? Sep 8, 2017	 What is the standard size for a comic strip? Aug 21, 2017	 Using GoFundMe… for comics? Aug 11, 2017	 Stop Promoting to Other Cartoonists! Jul 28, 2017	 When is a complaint actually a compliment? Jul 16, 2017	 Start planning holiday merchandise now! Jul 14, 2017	 Mailbag: How long should it take me to do a comic? Jun 15, 2017	 New Poll: What Site Improvement is Most Important? Jun 14, 2017	 Webcomics.com Poll: What scares you most? May 25, 2017	 What happened to the Harveys? May 10, 2017	 Webcomics Confidential Ep 14 — Do. A. Good. Comic. Mar 14, 2017	 Why are you doing a comic strip? Jan 24, 2017	 Will Net Neutrality Survive a Trump Administration? Jan 19, 2017	 Is your site SSL-compliant? Dec 16, 2016	 Should you be prepping for a subscription-based future? Dec 8, 2016	 Why do Patreon backers leave? Dec 7, 2016	 Webcomics.com Poll: Whom would you hire? Oct 25, 2016	 Mailbag: What’s the average price for a graphic novel? Oct 12, 2016	 Reminder: Webcomics.com Halloween Special! Oct 12, 2016	 Holiday shipping… plus, last-minute merchandise primer! Sep 27, 2016	 What is the standard comic-strip size? Sep 19, 2016	 Creative Commons — What is “commercial” use? Sep 13, 2016	 The future of ad blockers? Sep 12, 2016	 How long does it take to succeed? Aug 26, 2016	 Mailbag: How do I find an artist for my comic? Aug 22, 2016	 What If… Beating Convention Bootleggers was a Business? Aug 19, 2016	 Stop promoting to other cartoonists! Jul 16, 2016	 Start planning holiday merchandise now! Jul 16, 2016	 What’s the best way to handle a reader survey? Jun 15, 2016	 Mailbag: Should a first-time cartoonist “keep it short”? Jun 14, 2016	 Mailbag: Do I have enough pageviews to launch merchandise? Jun 8, 2016	 Webcomics.com Poll: The End of the Schedule? May 25, 2016	 Mailbag: Are Ratings Systems Trademarked? May 17, 2016	 Adult Coloring Books? Apr 25, 2016	 SumoMe plug-in — Is it worth it? Apr 22, 2016	 How Many Pageviews = Success? Apr 20, 2016	 Webcomics.com Poll: What are your update days? Apr 5, 2016	 “On The Spot” Hot Seat Critique — Regarding the Secret Life of Rabbits. Apr 4, 2016	 Join the discussion! Consider a guest post on Webcomics.com. Feb 24, 2016	 Tax Help! Feb 9, 2016	 Want an extra 2GB of storage on Google Drive? Feb 2, 2016	 Have I been hacked? Jan 28, 2016	 tpc.googlesyndication… what does that mean? 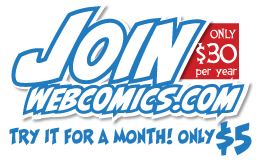 Dec 17, 2015	 Member alert: Comics People Talent Prize. Dec 9, 2015	 Should you be prepping for a subscription-based future? Oct 29, 2015	 Patreon Pro Tip — Setting Links to Expire. Oct 23, 2015	 Existential Crisis: Why Are We Here? Oct 21, 2015	 Surviving Creativity: Ad Blockers… Is it the End? Oct 20, 2015	 Should we be worried about new TPP regulations? Sep 29, 2015	 NYCC: Possible crackdown on unlicensed prints? Sep 15, 2015	 What am I — chopped liver? Sep 15, 2015	 The School-Year Bump — Is it Gone? Aug 19, 2015	 Stop promoting to other cartoonists! Aug 11, 2015	 Webcomics.com poll: How often do you update? Jul 28, 2015	 Google, Minus Plus? Jul 28, 2015	 A “Comics Oasis” in Vegas? Please. Jul 17, 2015	 Start planning holiday merchandise now! Jun 26, 2015	 Comic Scrapers: Threat or Menace? Jun 24, 2015	 Google Chrome… Is It Eavesdropping? Jun 23, 2015	 “Save for Web” … Legacy? Jun 23, 2015	 Microsoft hacked: Make sure you’re not next! Jun 22, 2015	 Is GooglePlus Delivering Results? Jun 12, 2015	 Archive Dive: Tell It Like It IS … or How It Ought To Be? May 20, 2015	 Webcomics.com Poll: What is your strongest promotional tool? Apr 16, 2015	 Are you mobile-friendly? Apr 10, 2015	 Mailbag: Is “Webcomics” a bad word? Feb 25, 2015	 Why would someone send me fake traffic? Feb 18, 2015	 No Comment? Is it time to redirect reader feedback? Feb 12, 2015	 What happened to my stats?! Jan 21, 2015	 Mailbag: How many people read my comic? Dec 11, 2014	 When is it time to advertise? Dec 5, 2014	 Friday Archive Dive: Christmas Hiatus? Nov 19, 2014	 To Alias or to Anti-Alias… that is the question. Oct 15, 2014	 Is RSS dead? Sep 26, 2014	 Friday Archive Dive: What a Waste of Time! Sep 23, 2014	 Are comic cons dying — or changing? Aug 29, 2014	 Mailbag: Should I sell my domain name? Aug 19, 2014	 WordPress: My Scheduled Post Won’t Post! Aug 13, 2014	 Gumroad offers Streaming… Books? Aug 12, 2014	 Square for an online store? Jul 31, 2014	 Start planning holiday merchandise now! Jul 21, 2014	 Webcomics.com exclusive: Webcomics Weekly KS-3! Jun 17, 2014	 Is it time to collaborate? Jun 12, 2014	 Writing: Tell it Like it Is — or Tell it Like it Ought To Be? Jun 4, 2014	 Graphic.ly leaves behind unpaid creators? May 28, 2014	 Webcomics.com poll: How many updates? May 15, 2014	 Disqus delivering text ads? May 13, 2014	 When do you update? May 13, 2014	 Mailbag: Too soon for ads? Apr 11, 2014	 Friday Archive Dive: How many Pageviews = Success? Mar 21, 2014	 Friday Archive Dive: Stop giving them the finger! Mar 20, 2014	 The huge traffic spike — is it real?! Feb 20, 2014	 Facebook advertising – harmful? Jan 7, 2014	 First Hot Seat of the New Year! Dec 23, 2013	 The Christmas break — are you taking it? Dec 18, 2013	 Mean, insulting, degrading… and funny? Oct 29, 2013	 3 easy steps to be listed FIRST as a Graphic Designer! Oct 28, 2013	 “Breaking Bad” creator: A vote for “work for exposure”? Oct 21, 2013	 Existential crisis: Why are we here? Oct 10, 2013	 Hitch It / Ditch It: Blow the Cartridge, Average Joe, I am ARG! Sep 30, 2013	 Q&A: InkOutBreak for a beginning webcomic? Sep 26, 2013	 Merry Christmas! Aug 20, 2013	 Fix your broken links! Aug 13, 2013	 Comic Easel: Adding Jetpack’s Share Buttons directly under the comic. Aug 1, 2013	 Mailbag: How Big a Buffer? Jun 4, 2013	 Digital Downloads as Convention Merchandise: A Quest? Apr 30, 2013	 How Many Pageviews = Success? Apr 19, 2013	 Comic Rocket and AdSense Errors? Apr 1, 2013	 Who’s the Fool? Mar 20, 2013	 Convention Merchandise: Sunday Sale? 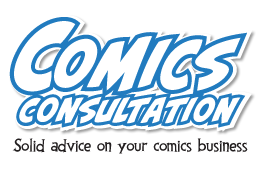 Mar 6, 2013	 Mailbag: Are comic conventions through? Feb 18, 2013	 Mailbag: To Origin or not to Origin? Feb 12, 2013	 Digital tablets – guide to pixel dimensions, resolution and aspect ratio. Nov 19, 2012	 Monday Creativity Exercise: What is this? Nov 12, 2012	 Monday Creativity Exercise: What is this? Oct 22, 2012	 Mailbag: Where to draw the line on copyright? Sep 11, 2012	 Creativity Exercise: What is this thing? Sep 4, 2012	 Creativity Exercise: What is this thing? Aug 6, 2012	 Monday Creativity Challenge: What is this this? Jul 30, 2012	 Monday creativity exercise: What is this? Jul 18, 2012	 PulsePoint (nee ContextWeb) drops to… zero? Jul 5, 2012	 Google Plus: Dead in the Water? Jul 3, 2012	 Creativity Exercise: What IS this thing? Jun 25, 2012	 Monday Creativity Exercise: What is this? Jun 19, 2012	 Creativity Exercise: What is this? Jun 7, 2012	 Mailbag: Should I take a break? May 25, 2012	 Mailbag: When is a number news? May 15, 2012	 Mailbag: More information on designing books? May 2, 2012	 Ready to go mobile? Apr 11, 2012	 Mailbag: Is Graphicly Worth It? Mar 12, 2012	 Comic Scrapers: An alert and … an endorsement?! Feb 27, 2012	 Exclusive Member Benefit: Busy Beaver Button Co.
Feb 9, 2012	 Mailbag: Color vs …humor? Feb 8, 2012	 Mailbag: Flexible format? Jan 10, 2012	 How much time to set up a Web site? Jan 7, 2012	 My ad revenue tanked! Dec 29, 2011	 Two Years? TWO YEARS?!? Dec 20, 2011	 Using QR Codes without a smartphone? Nov 16, 2011	 Pibster… monetizing Twitter? Nov 14, 2011	 Copyright Small Claims Court? Oct 26, 2011	 Women in independent comics? Oct 24, 2011	 Next “Hot Seat” critique… any suggestions? Oct 13, 2011	 Will Webcomics Accept a Photo-Comic?! Oct 10, 2011	 Facebinks: What did we learn? Sep 21, 2011	 Contract Bank? Aug 30, 2011	 Mailbag: Brand the Comic or the Cartoonist? Aug 17, 2011	 Q&A: Great Minds…? Aug 15, 2011	 Good News! “How to Make Webcomics” Re-stocked! Again! Jul 14, 2011	 Google+ … What can we add to it? Jul 11, 2011	 Mailbag: POD to Offset? Jun 27, 2011	 Mailbag: Will Disney/Marvel change convention-commission culture? Jun 23, 2011	 Comic scrapers — threat or menace? Apr 26, 2011	 Mailbag: Time for a Banner? Apr 20, 2011	 Mailbag: When is a Number News? Apr 12, 2011	 MSN: A Comics Extinction? Mar 17, 2011	 Do you need a separate ISBN for your ebook? Feb 24, 2011	 What is NOT protected by copyright? Feb 14, 2011	 How to Make Webcomics (3rd edition) now available! Jan 25, 2011	 Poll results: How many updates are in your buffer? Jan 18, 2011	 When is it Done? Dec 21, 2010	 Mailbag: Consistency in lettering changes? Nov 29, 2010	 How Come There Aren’t More Full-Time Webcartoonists? 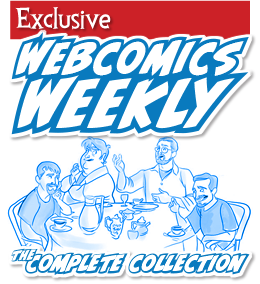 Nov 17, 2010	 Webcomics Weekly #70 — Get Off Our Lawn! Nov 3, 2010	 New Year’s Resolutions… remember those? Oct 12, 2010	 Print vs Web… vs App? Oct 6, 2010	 “How To Make Webcomics” is sold out. Again. Sep 22, 2010	 Boundaries: Build ’em or Break ’em? Aug 24, 2010	 Buying a one-year membership in August?! Jun 17, 2010	 Webcomics and… Fatherhood? May 12, 2010	 Getting Ripped Off? There’s an App for That! Apr 1, 2010	 Is incorporating right for you? Mar 24, 2010	 Welcome New Subscribers! Mar 22, 2010	 What’s in your (con) wallet? Mar 3, 2010	 Print vs. Web has nothing to do with Print. Or the Web. Feb 24, 2010	 Mailbag: Copy/Paste Cheating? Feb 17, 2010	 What is Your Time Worth? Feb 17, 2010	 Above the Fold: Q.E.D. Feb 4, 2010	 Q&A: Not Ready for the Convention? Jan 13, 2010	 Great News for Webcomics.com! Dec 24, 2009	 Merry Christmas! Dec 21, 2009	 Mixed Punctuation?! Dec 15, 2009	 Mailbag: Is it Time to Give Up? Nov 26, 2009	 Happy Thanksgiving! Nov 3, 2009	 Facebook or SEO? Oct 6, 2009	 Mailbag: Site Censorship? Sep 23, 2009	 Mailbag: Fundable? Sep 16, 2009	 Mailbag: Text-only ads? Sep 4, 2009	 20 TIPS for Webcomic Beginners! Aug 26, 2009	 No Spec for you! Aug 12, 2009	 Mailbag: What to Sell at a Con? Aug 3, 2009	 Is the time right for a calendar? Jul 1, 2009	 Welcome to the New Webcomics.com! Jun 23, 2009	 Anyone got WordPress / ComicPress advice? May 28, 2009	 What about “About”? May 26, 2009	 Experimentation: When to Begin? Apr 28, 2009	 Joining a collective? Apr 8, 2009	 LIVE… from Seattle… it’s Webcomics Weekly! Mar 31, 2009	 Emerald City Comic Con: This Weekend! Mar 19, 2009	 Webcomics Weekend! Mar 10, 2009	 Has the political cartoon died? Jan 28, 2009	 … But What About Long-Form Comics? Nov 17, 2008	 Web Statistics: Tylenol® anyone? Nov 6, 2008	 Publish Now / Pay Later? Aug 27, 2007	 Webcomics Weekly Episode 1: Webcomics Weekly ASSEMBLE!